Canary Backer and Pre-Order Update – August 15 | Canary Blog. 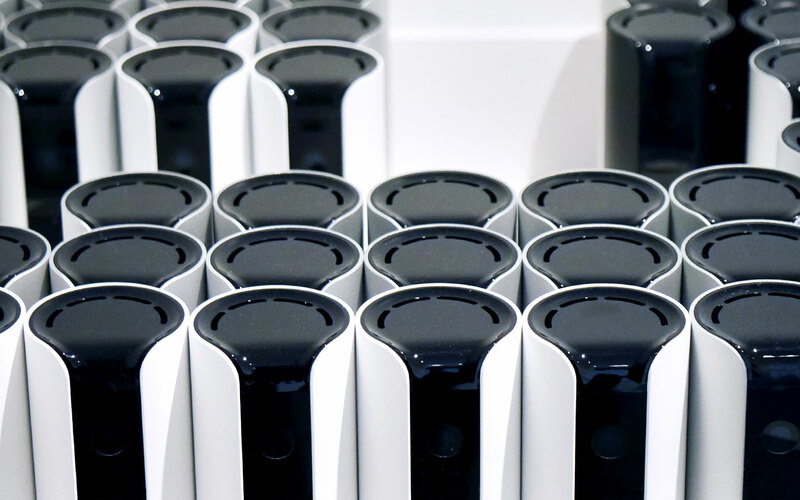 The big moment is nearly upon us—Canary devices will be rolling off the assembly line next month for mass production. Concurrently, we’ll be finishing up our beta testing so we can ship your units as soon as the firmware on the device has been tested and finalized. What does that mean for backers? Most of you will receive your Canary in October, and as we get closer to shipping, you’ll get an email with a delivery timeline for your specific units. Some international users will receive their Canary devices starting in November as there is additional testing and certification that we’re going through to comply with local laws. Although it’s a little later than anticipated, we can’t wait to get Canary into your hands and we’re working around the clock to make that happen. Last week, we held a sneak peek event for Canary backers in the New York City area. We demoed the app, showed off the hardware, and—the part we enjoyed most—spoke with some of our backers and pre-order customers. It was a thrill for us to learn more about how they plan to use Canary, and get their feedback on our design and user experience. To give everyone a better understanding of what we’re working on right now, we’d like to share some of the details our team presented at the event. Over the past few months we’ve been focused on a process called Design Quality Assurance (DQA), which is the exhaustive testing of every single component. We’ve spent days analyzing the performance of individual sensors to ensure they meet our standards. This analysis is the basis for a larger integration; DQA lays the foundation for the testing we do on the assembly line where we need to be able to test a component in under 30 seconds. Test stations all along the assembly line gauge the performance of individual components including the sensors, Wi-Fi antenna, camera, and microphone. We’re setting these up now in preparation for mass production. In addition to DQA (which is focused on engineering rather than aesthetics), our industrial design team is conducting its own quality assurance tests as well. The process is similar to DQA, but our designers are looking at a different set of criteria. One aspect of industrial design quality assurance involves examining part tolerance—the alignment and spacing of different parts. The photo below is an example of the part tolerance we’re looking for on the camera lens cover and the front face of the device. The lens on the left is properly aligned with the front face of the device, while the one on the right—the “fail”—is off by roughly half a millimeter. It may not seem like much but in the final stages leading up to mass production, inspecting each device with this level of detail enables us to deliver the quality you expect from a design-led company. Right now, the name of the game is testing. On the hardware side, we’ll continue to refine the assembly line process and tests, and on the software side, we’ll focus on scaling our infrastructure and improving data security. We’re nearing the finish line, and our entire team is grateful for the continuing support from our backers and fans. A big thanks once again for making this possible!